Discussion thread – Social Cost of Carbon | Climate Etc. The Social Cost of Carbon is absurd but entrenched. The projected global economic damage is then discounted to present value. Finally, in a true tour de force, part of this far future damage is allocated to present day emissions on a per ton basis, even though a lot of future emissions are required for the damage projection. The result is a specific dollar amount of discounted future damages attributed by ton to today’s emissions. The SCC is based on averaging three IAMs, all of which project great future damages. The SCC is much more than an exercise; it is a dangerous policy cancer spreading throughout the US Government. Federal agencies are increasingly using it and so are the Federal courts. But the computer modeling behind SCC is quite literally absurd. The principal absurdity is that the modeling is over a 300 year future timeframe. This includes modeling of emissions, climate change, economic development and economic damage, all for the next 300 years. Apparently it is necessary to go this far into the future because the purported climate change damages come on very slowly, especially sea level rise. Given enough time and the necessary assumptions we can sink many major cities. In normal impact modeling the discount rate serves to limit the timeframe to a few decades, but in SCC this does not happen. A combination of economic growth, population growth and damage growth largely offsets the discount rate. This opens the door to fantastic multi-century forecasts. The thing is that we cannot possibly forecast this far into the future. Consider especially the issue of forecasting technological progress, because given the right technologies we can adapt to climate change, should it actually occur. Three hundred years ago George Washington was not even born yet. The people living in the early 1700’s could not possibly have imagined today’s world. In the same way, there is no reason to believe that we are in a position today to look 300 years into the future. Yet this is precisely what the SCC computer models claim to do. In fact it is commonly said that the pace of change is quickening. If so then the changes over the next 300 years are likely to be much greater that those over the last 300. We may actually be in a worse position for forecasting than the people were in 1717. We have more science, but nothing that lets us predict how the world will be in 300 years. Under these circumstances it is obviously impossible for a computer model to provide meaningful 300 year projections for policy purposes. Yet this is precisely what the SCC models claim to do, or rather what the Federal agencies claim they do. It is not clear that the owners of these computer models endorse these claims, but neither do they publicly oppose them. The agencies may even be funding them. Clearly this computer modeling is pure speculation, not science. There are no testable hypotheses here. Nor is there settled scientific support for the alarmist assumptions built into these computer models. Programming alarmism into a computer does not make it scientific. Simply put, it is absurd to base public policy on these 300 year projections. Moreover, the specific Federal SCC results are suspicious, for several reasons. To begin with there are the big adjustments. The SCC modeling numbers were first announced in 2010. Three years later they were adjusted upward by a whopping 50% or so. Then too the SCC per ton damages are remarkably similar to the per ton carbon tax numbers that have been proposed in Congress. The SCC numbers come in a range, based on the discount rate used. The carbon tax proposals also come in a range and the two ranges are roughly identical. This suggests that the models have been tuned to match the tax proposals. Clearly the Trump Administration should try to rectify this situation, but it may not be easy. If they simply change the damage estimates, say by using a higher discount rate, then they are endorsing the absurdity. If they try to ban the use of the SCC, say via an Executive Order, they will run into the Court orders. Unlike Court orders, Executive Orders have no force of law; they are merely administrative. It may be that only Congress can ban the use of the absurd SCC. It certainly should. Every reader of this blog should write, or go-online, and contact their congressman/woman and their two US Senators to stop this activity by defunding it. Also, make this known to Mitch McConnell and Paul Ryan. Staff keeps track of the number of messages,letters, emails etc, on topic and if there is a large number, attention is paid big-time. Finally, once Scott Pruitt’s email address is posted on the EPA website, let him know also. I too am quoted. See also my https://judithcurry.com/2016/09/28/how-to-constrain-the-abuse-of-science-by-federal-agencies/. Banning the use of SCC in Federal decision making is a big part of this. Personally, I don’t think the opinions of an 83-year old retired sedimentologist and oil company consultant who has spent years dismissing climate change and climate scientists should influence the future of younger generations, who are, after all, the ones who would have to live with the consequences of his deeply mistaken advice. I prefer to see an intense focus on writing off the national debt. That’s something future generations will really appreciate. The social cost of carbon can be revisited in a few years to see if it’s necessary. We do need to consider that emissions aren’t growing that much, that solar and wind turbine bunnies claim that renewables are cheaper than coal, and that oil and natural gas are likely to go up. Ad hom. Please attack the argument not the person. So simply ignore all of the points David makes because he’s 83 and has worked as a consultant in the energy field. Forget all of the issues with the models. 300 year old timelines alone are enough for anyone to recognize that SCC numbers are totally worthless. If you disagree Magma, show evidence why they are not. Judith and David Wojick, thank you for this post. I hope for a rational, objective discussion of this issue. It relates to the most important question that needs to be addressed, but hasn’t yet despite 30 years of climate research and UN climate conferences – i.e. are GHG emissions likely to do more harm or more good this century? You cant have a rational discussion when the OP claims the subject is absurd. Of course rational people can take issue with the assumptions, then we could have a rational discussion of the most informative way to understand the problem. This is the Achilles Heel of the CAGW alarmists’ beliefs, and you hate it. Every time it comes up you make stupid comments, rather than engaging constructively. If you have some arguments to make, why don’t you make them? It makes sense that the philosophically bankrupt would come to the above conclusion. There is an entire absurdist movement that disagrees. The absurdist movement was, of course, drawn towards humanities proclivity to find inherent value and know the meaning of life. David’s opening salvo, given the context, is appropriate. The discussion that followed the absurd movement was and remains robust. The irony with Mosher – isn’t always ironic when it comes to Mosher?- is that he seems to advocate the limits of humanities freedom, and might find cogent arguments from the absurd movement to help him make his own, but how can you tell someone who knows precisely what they want to know? Camus, who encouraged people to both embrace the absurdity of life while simultaneously railing against it, also argues that it is integrity not morality that matters. But go on, sport; keep dismissing that which you cannot understand. The subject is not absurd, just the present practice. The cost and benefits of combustion are an interesting topic. Our civilization is still based on fire. a process and approach that is well understood is absurd. You cannot have a rational discussion with a person who believes that we can know what the world will be like in 300 years. That this claim is irrational is precisely my point.There is literally nothing to discuss. Who was here in 2007 demanding that all the data and code be free, so that skeptics could have the freedom to do their own science. your government away from my right to bear arms. I dont a dang who or what you marry, because i think the government should not be in the business of giving marriage licences. Oh ya, there are limits on freedom. I dont want you peeing in my drinking water or dumping your waste in my air. If you want to dump your waste in my air, then we have to negotiate that. One man’s waste is another plants fertilizer. 88% of the Fortune 500 companies that existed in 1955 didn’t exist in 2015. If we were to assign the same level of foresight to the current generation of people who claim they can foresee the future as existed 60 years ago the subject of projecting out 300 years is indeed absurd. In the year 2005 the US was building natural gas import terminals. There was also a crazy guy on the internet that correctly predicted Chinese ‘peak coal’. Peak coal occurred in North American, Europe and now China. The 30 year emissions projections are all wrong as a result..never mind the 300 year projections. So many things wrong with this, especially coming from a self-described libertarian. First, which is your air and which is mine? Second, who defines what is waste and what is not? Third, what constitutes dumping and what doesn’t? Fourth, when did it become about you only? Can’t even begin to start with the other absurd statements (especially for a self-described libertarian). Seems to me you are, at best, a fair-weather libertarian. Actually, it seems to me you want your own way for those things you really care about. Which is really about be narcissistic, isn’t it? You are a carbon based life form. and everything you eat provides you energy only because plants photosynthesized that energy from carbon dioxide in the atmosphere. You don’t get to regulate carbon dioxide, especially since you can’t even demonstrate harm, and benefits both to you and society are clear. Again, given that the SCC is concerned with inherent value, and considering that this is weighed against the meaning of life, i.e., humanity’s fate under a Goldilocks climate vs their fate under a really, really scary climate, the use of the word “absurd” is more than appropriate. When David uses the word “literally” it is quite possible that he means exactly what he says and he is referencing absurdist philosophy and is not being metaphorical or figurative in the use of the word absurd. I do not see any reason to assume that David means by that word “logically impossible” and could very well mean absurd as in “humanly impossible”. That absurdity arises from the conflict between a simultaneous existence of the universe and the human mind is the cornerstone of absurdist thought, and the critiques of inherent value and meaning of life are certainly capable of rational thought. Stop being disingenuous Steven. In the context of absurdism, and more particularly Camus’ argument to the absurd with ‘The Myth of Sisyphus’ where Camus argues that the absurdist has no interest in freedom as free will, instead embracing the “freedom” that comes with established rules. So do progressives, conservatives and anyone else who would otherwise argue that those eyes are expected to monitor *other peoples* bedroom. You know *them*, not me or you, but *they*. Apparently this is now true of *Libertarians* as well. Could you be anymore ambiguous? Are you one of those progressive/libertarians? My waste includes what I exhale, which happens to be Co2. More importantly, it doesn’t just seem to me that you advocate limits to humanities freedom, it seems that way to you too. If you were libertarian wouldn’t you be less concerned with what others are doing ambiguously, and more concerned with the specifics of injury caused by unwarranted use of force? By that I mean, wouldn’t you have, instead of relying on ambiguity, been inclined to argue that if you are injured by some other person’s urinating habits that you expect an opportunity for redress of grievance and to seek remedy? Wouldn’t you argue that a specific chemical caused by another’s waste expulsion into the air is demonstrably injurious and therefore becomes a compelling argument for the use of government force to regulate? I wonder if you even understand the difference between the two examples of peeing and waste you gave in the context of law? If you want to negotiate how much “waste” I “dump” in the air – presumably in order to do that the “waste” would have to be lighter than air – you’re going to have to get a whole lot more specific than that, and you will definitely have to demonstrate injury caused by this “waste” before I will even consider negotiations. But go on, tell us all how you’re really not advocating limits to freedom, i.e., expanded government to regulate humanity’s “dumping of waste in the air” to the point where I have no say in the “negotiations” regarding my “waste”. You can’t have a rational discussion when the topic of discussion is irrational. Even if one were to agree with all of the models used to create a SCC number, and all of the parameters inputted to said models, there is still the 300 year timeline required to produce a number that calls for action. That IS absurd. Google “Robert Murphy, Social Cost of Carbon” for a number of papers and statements concerning this topic. Trump’s transition team appears to be all over the SCC issue. Bloomberg had a good article recently. If we accept what David Wojick’s post says, then what rational, objective justification is there for policies to mitigate GHG emissions? The same IAMs used to estimate SCC are also used to estimate the costs and benefits of policies to abate GHG emissions. The analyses show that the costs of the mitigation policies would exceed the hypothesised benefits this century, and this is using assumptions and inputs parameters that favour high climate damages for GHG emissions and therefore high benefits from mitigation. The char below chart shows the output from DICE-2013R for six of the main policy scenarios widely analysed and debated (plus one I added). I’ve plotted the DICE net-benefit of mitigation policies per 5 years for just this century, rather than plotting cumulative out to 2300, which is commonly done but hides the reality of the negative net costs this century. I added the scenario shown by the red line. I halved the assumed Copenhagen participation rate; all other inputs are the same as the ‘Copenhagen Scenario’. The Copenhagen Scenario assumes 100% of all global GHG emissions are measured and taxed by 2100. Countries are assumed to come on board progressively from 2010. US is assumed to tax all its GHG emissions at the optimal carbon tax rate by 2016, China by 2020, etc. We should provide a word of caution about the optimal case. It is not presented in the belief that an environmental czar will suddenly appear to promulgate infallible canons of policy that will be religiously followed by all. Rather, the optimal policy is a benchmark to determine how efficient or inefficient alternative approaches may be. This is the best possible policy path for emissions reductions, given the economic, technological, and geophysical constraints that we have estimated. •	All countries act in unison to increase the optimal carbon price periodically and continue to maintain the carbon price at the optimal level for all of this century (and beyond). If these conditions are not met, the projected benefits of carbon pricing would not be achieved. o	Unrealistic participation rates (100% from 2010 for all policies except Copenhagen. Copenhagen participation rate is assumed to be 20% in 2010 and 100% in 2100. (World Bank says it is 12% in 2015). However, near 100% is near impossible to achieve. Even half the assumed Copenhagen participation rate seems unlikely to be achieved. Thank you for reminding me of that. I still feel the same as I said then, but here I am trying to ask questions of those who know much more than I do. We used to have these conversations over at Tony’s of course, but nothing has changed except we are increasingly focused on co2 when, as far as I am concerned, there are far more things more important than that to worry about. To the concerns we had five or six years ago needs to be added the ever greater threat of cyber hacking, cyber and physical terrorism and the ever present likelihood of another Carrington event. This latter event and a modern counterpart is discussed in some detail, along with other down sides to over dependence on technology in a book just issued ‘the dark side of technology’ by peter townsend. Perhaps the ‘deep space climate observatory’ will be positioned to give us eight minutes warning, perhaps not. AGW may in itself be less of a worry – but the West’s obsession with unilateral and pointless action to ‘fight’ it is a real and serious worry. I agree however about cyber threats, terrorism and a possible Carrington event being causes for serious concern. I read a review of Townsend’s book only this morning – interesting echoes of Y2K although unlike that there’s not much we can do to prevent a massive solar flare. Eight minutes warning is unlikely to help very much. But Peter, if you consider the SCC’s estimates to be a ‘complete joke’ (because of what’s happening out there in the real world where the US is responsible for only about 15 percent of GHG emissions), what do you hope to learn from those ‘who know much more’ than you? Do you think they may have a better understanding of the world beyond the USA? I am conscious of the politics. I agree with Richard Tol that the politics and SCC is not going to go away because people who do not accept it say it is wrong. There needs to be a rational objective discussion about it. If there is a sound basis mitigating GHG emissions, I want to know. I genuinely want to know! Researchers like Richard Tol have spent most of their careers researching this subject and the damage function (which is my primary area of interest right now). I haven’t. I have genuine questions and I hope I can get answers. They may be able to answer my questions and set me straight. But Peter, surely that’s a different issue? Perhaps you’ll learn that there is indeed a ‘sound basis for mitigating GHG emissions’, but that wouldn’t alter the unfortunate reality that the developing countries (plus Russia and Japan) seem not to be interested. And isn’t it that reality that makes a nonsense of the US government’s SCC estimates (the topic of David Wojick’s article) – whatever those ‘who know much more’ than you may say? I suppose however that I must acknowledge that this discussion may give you an opportunity to determine whether the ‘experts’ really have a case for their claim that humanity should be reducing its emissions. My questions are about global impacts and policy, not USA impacts and policy. Economists know their business much better than I do. Asking them questions to learn is valid. Trying to block open, rational debate is not. I want to understand the basis for the damage functions, SCC and net-benefits of proposed mitigation policies. If I am wrong I want to know, asap, so I don’t continue to talk nonsense and then find I was wrong all along. An scientist or engineer telling an economist he/she doesn’t know his/her business is as silly as an economist telling a scientist or engineer he/she doesn’t know his/her business. I want to be able to ask my questions and get answers from those who understand much better than I do. I may have follow up questions. I’ll draw my own conclusions – eventually. Apologies for spelling your name incorrectly. I suggest you, David Wojick and others who are genuinely concerned about the long term consequences of the Obama and EPA policies for the USA should be supporting the questions I am asking and be asking similar questions. It was pointed out on a recent thread that Trump’s approach may be to get independent, research of SCC and if it is found to be unsupported by valid evidence to use this as the basis to unwind much of the Obama and EPA polices that many people agree will seriously damage the USA economy for almost no benefit. How can the characterization of damages used to estimate the SCC be improved over the next 1-3 years through incorporation of existing evidence or changes to modeling approaches? (a) The major task that could help (and probably the only one feasible over a 2 year time frame) would be a careful and comprehensive review of existing damage estimates. This would involve a team of disinterested analysts who looked at existing studies and synthesized their findings. I agree with this and emphasise the importance of a team of disinterested analysts, as long as they competent and have no axe to grind. My (admittedly boring) point is that whatever the findings of that team of disinterested analysts – whether or not the SCC was found to be supported by valid evidence – would make no practical difference. Because most of the world has no plans to reduce emissions, the Obama and EPA polices would seriously damage the USA economy either way. This has happened because the US was hopelessly weak in pre Paris negotiation, preferring any agreement to another Copenhagen-style debacle. Why? Well one answer might I suppose be a perceived need to preserve Obama’s ‘legacy’. But that would hardly be a sensible position for an administration that asserts that continued GHG emissions risk global catastrophe. Again, we are talking at cross purposes. You interest is in policy USA and a very short time frame. I agree with you that is important for US citizens for the near term. I am interested in this for other high-income countries too. However, my questions are not about this. If I dive right down, they are about the evidence to derive and calibrate the damage function, and the basis for the estimates of SCC for the world. My time scale is very different. To me it is irrelevant that low and middle income countries are not interested in signing agreements to cut their emissions at this time. However, if the SCC was valid, they would become interested as they become wealthier. Times change. Our time frames and interests on this subject are somewhat different. However, I still urge you to consider that the best way to unwind the US polices implemented by Obama and EPA is to show that the SCC is not valid or grossly over stated. That’s where I think you should focus your agenda. Those who try to argue SCC is BS without evidence will be dismissed as deniers and extremists. I am not interested in the specifics of the damage function, Peter, because I regard the exercise as fundamentally absurd, so I have never looked into it. However, my guess is that the biggest component is simply inundation due to sea level rise, where the damage might just be the value of the land lost. What that land is worth when lost hundreds of years from now is then the economic question. But again, I want to ban the use of SCC in agency cost benefit analysis. By the way, from what I have read it may be that part of the damage is the loss of the use of the land and that damage occurs every year after the land is lost, so it adds up continuously. But Richard Tol should be explaining these things to us, or at least pointing us to the explanations. There is a hefty literature on the IAMs. My interpretation of these two papers is that sea level rise is a relatively small cost over 100 years and dwarfed by the benefits of warming for agriculture and human health and by the cost of energy at large temperature increases. (I’d like to understand more about the energy cost item: I asked Richard Tol in a comment above – he hasn’t answered yet – My questions may be too long-winded, he may be considering them or he may not want to answer them here for fear of misinterpretation, misunderstandings or misrepresetnations. These costs are dwarfed by the benefits for agriculture and health (see Figure 3 in the first link). Regarding your link to Richard tols paper. I would make a couple of comments. I was involved with the South west branch of the UK environment agency for some nine years, who, amongst other tasks, are responsible for flood prevention. Their remit includes river and coastal flooding as well as that caused by, for instance, water run off from buildings and hard surfaces. Generally flood prevention can be considered as infrastructure which is generally considered to be a positive matter rather than a cost. Not only are jobs created to build such hard defences as walls but also subsequent maintenance and such things as river clearance of silt. Part of the EA remit is that hard flood defence work in particular should have a regeneration element. As an example a mix of run down houses and warehouses in a decaying port might be difficult to justify protection on a strictly cost benefit analysis basis, but when the regeneration of the area is considered-additional housing, warehouses turned into bistros etc- it becomes ‘profitable’ and desirable. Of course flood protection also enables housing and commercial development in areas where arguably they should not be permitted, such as flood plains, again providing revenue and economic growth. So on the whole sea level rise or river flooding will generally result in a positive outcome if handled intelligently. Thank you for this. Also thank Richard Tol for his response. TonyB, I understand your comment. I also understand that all the economist like Richard Tol can hope to do at this early stage of trying to define the damage function is to do very broad assessments as he has done. Like you, TonyB, I am concerned that the broad approaches do not fully take into account the fact that we replace most infrastructure on around a 50 to 80 year life cycle and doing so increases productivity and wealth. I only understand a very small part of what the economists are doing, but I fear there is unintentional bias and cherry picking of the impacts that have the highest damages. Tol’s Figure 3 http://www.copenhagenconsensus.com/sites/default/files/climate_change.pdf shows that by far the greatest cost of warming is energy cost. However, I suspect energy cost per unit can decline enormously if and when we stop blocking progress to what is potentially by far the most economical and sustainable low emissions energy source. The models count the net present value of the land lost at the time the land is lost to sea level rise. Not so, Peter. My interest is in international politics and policy regarding climate change and their likely development over the medium (say to 2050) term. In particular, I’m interested in China – and, to a lesser extent, India. Is China a low, middle or high-income country? Well, its population comprises all three, with some of the wealthiest middle classes in the world. Moreover, its per capita emissions reportedly exceed those of the EU. ** So, by your reckoning, it should be interested in the SCC. But it’s not. Indeed, there’s compelling evidence – both of word and deed – that China is unconvinced that the continued emission of GHGs is a serious (if any) threat to humanity. And, because in pre-Paris negotiation China, supported by India, acted as the developing world’s representative, the result is that countries responsible for about 75 percent of global GHG emissions are more likely to increase than to reduce them. This has huge implications for the medium – and almost certainly the longer – term. Therefore, although it might perhaps be useful to show that the SCC exercise isn’t valid (although it’s likely to take a long time with believers fighting it to the bitter end), I suggest a more practical way to unwind current US climate policies is to show that, given what’s happening in the wider world, they’re completely pointless. I’ll come back to this another time. For now I want to focus on trying to forget answers to my questions. We are talking at cross purposes. What you are wanting to discuss here is not what I want to discuss at this time. I’ve discussed the points you are making many times before on other threads. If you read it, it may reduce the misunderstandings, and the amount of background we have to explain in each comment. However, for now, I want to focus on trying to get answers to my questions about the damage function. Here’s a different approach to respond to your last comment and explain why I am focused on trying to understand whether or not there is valid evidence to define and calibrate the damage function. My interest is in international politics and policy regarding climate change and their likely development over the medium (say to 2050) term. In particular, I’m interested in China – and, to a lesser extent, India. This is an argument as to why carbon pricing and command and control policies cannot be justified in individual countries and regions and therefore, if implemented are unlikely to be sustained (I explain why here: https://anglejournal.com/article/2015-11-why-carbon-pricing-will-not-succeed/ ). We are in agreement on this point. However, that does not provide any evidence s to whether GHG emissions will be net harmful or net beneficial this century. If we can’t get a valid, justifiable answer to this question, it will remain as a point of contention indefinitely. That is why I am asking questions about the damage function. Have you seen any calculations in the sea level discussions that takes into consideration the attribution issue between natural variability and AGW as to how much of the SLR, and thus damages, should be attributed to non carbon sources? I did not see anything pertaining to that allocation in the links you provided, so I assume all the costs of SLR are attributed to Carbon. In reality, beside the division of warming there is the subsidence and geological factors that affect the coast lines and are thus responsible for a percentage of the anticipated damages. Have you seen any calculations in the sea level discussions that takes into consideration the attribution issue between natural variability and AGW as to how much of the SLR, and thus damages, should be attributed to non carbon sources? No. That would be a good question for Richard Tol to answer. My understanding (perhaps misunderstanding) is that the Anthoff, Nichols and Tol paper is estimating the cost of sea level rise, not sea level rise attributable to human caused GHG emissions and not attempting to say how much sea level rise could be avoided by GHG mitigation policies (I suspect virtually none of it). Determining whether or not continued GHG emissions will be harmful this century would certainly be valuable. After all, for the reasons I’ve indicated, continued GHG emissions are very likely, so it would be most useful to know where we’re heading. So I wish you luck – but suggest it’s unlikely you’ll achieve your objective: those who predict serious harm are not going to surrender easily. And that’s why I believe your earlier suggestion that a determination that the SCC is invalid would be the best way to unwind current US climate policies is probably invalid. Better surely to demonstrate – from real world evidence – that they’re pointless? Yes, I’ve read Why carbon pricing will not succeed. I accept your argument that carbon pricing cannot be justified in individual countries as a means of reducing GHG emissions. However I believe your paper is based on a false premise: that individual countries see GHG reduction as a policy objective. Take China, the leading developing country, as an example. China is – as I noted above – unconvinced that the continued emission of GHGs is a serious threat to humanity. Therefore GHG reduction is not an objective and therefore whether or not carbon pricing is the cheapest way of reducing GHGs is irrelevant. Determining whether or not continued GHG emissions will be harmful this century would certainly be valuable. It’s more than valuable. It’s essential to showing that the belief in CAGW is not justified, invalid and mitigation policies that would raise the cost of energy cannot be justified on a rational basis. those who predict serious harm are not going to surrender easily. I totally agree and that is the main point I am making. I argue that simply making unsupportable assertions that CAGW is wrong will get nowhere. Asserting that CSS is invalid will get nowhere. People have been making unsupported assertions like this for 30 years, and getting nowhere. The CAGW dogma has been winning up to now. My argument is the best way to bring reality to the rational, objective, open-minded people who have believed the CAGW meme until now is to use SCC to show CAGW is not correct. Achieve this by showing that SCC is low, negative, or perhaps zero. This then also shows that mitigation policies will do be more damage than no mitigation. … a determination that the SCC is invalid would be the best way to unwind current US climate policies […?]. How do you propose to get a determination that SCC is invalid? What is your argument, who will make the determination and what impact will it have? I don’t understand what you are proposing so can you please explain to me your idea. Better surely to demonstrate – from real world evidence – that they’re pointless? How? If that can be done, why hasn’t it been done already? However I believe your paper is based on a false premise: that individual countries see GHG reduction as a policy objective. This suggests you have misunderstood. But, as I have already explained several times, I do not want to get diverted into discussing that paper here now –it’s been debated at length previously. If that could be shown – and quickly – I would wholly agree. Then you asked how it might be possible to demonstrate – from real world evidence – that the Obama policies are pointless. You also asked why it hadn’t been done already. Good questions. As to the first, the answer would be fairly straightforward although very detailed. It would have two parts: (1) a review of the poorly understood outcome of the Paris Agreement – examined here and here and (2) a comprehensive overview of the massive investments in fossil fuel plant being implemented throughout the world. As to the second, I believe it’s because so many people are concerned about the science of climate change and so few about the relevant international politics and – especially – developing country policies and actions. As to your paper, I only mentioned it because you’ve referred me to it – more than once; by all means let’s not get diverted onto that now. And I’d be most interested to see your response to my points about China and India – but perhaps not now. I don’t think we’ll get anywhere by arguing about our different approaches further. No need – our approaches are not mutually exclusive. Indeed each could reinforce the other. So I wish you success with yours, and hope you’ll feel able to reciprocate. This is nuts, and you can’t reason with insanity. Courts and politicians and bureaucrats and people who call themselves scientists, are now using 300 year predictions of doom to justify presposterous plans to control global climate change and plan the future of mankind, and to impose their coercive schemes over all of our lives and properties. Writing your Congress-person or a federal agency director or filing a court case is simply buying into the authority and capability of the government to control everything, in the interest of mankind. It is time for rational people to reject this authoritarian effort to take away the rights and liberties of people everywhere. At a 3% discount rate, future damage is discounted 95% per century, so unless climate damage increases by a factor of twenty per century, later centuries don’t count much towards the total cost at all. This is why they can stop at 300 years and it would be almost the same result as at 200 years. It converges because of the discount rate. Yes, except the scc discount rate is not 3. Fact. And, the SCC damage function is not net. Fact. And, there as so many obvious other bloopers the whole SCC thingy is not worth further discussion. Wrong is wrong, whether once, or twice, or many times. OK, see this and links therein. The often quoted $40 per tonne comes from a 3% discount rate. It only took a minute to find this one so it is just a random sample of what there is available to read on the subject. The table below shows the net present value (NPV) from 2010 to 2050, 2100, 2200, 2300 for the Copenhagen scenario (column 2) and the 1/2 Copenhagen participation rate scenario (column 3) (2010 US $trillion). At the Copenhagen participation rate, which as noted above is optimistic, the NPV is negative for all this century. At half the Copenhagen (optimistic) participation rate NPV is negative to 2300 and beyond. $40 per tonne works out fairly cheap too, and if it is done as revenue neutral, the low energy users will net gain from the rebates. Alternatively it could be used to subsidize residential energy costs or incentivize transitions to clean energy. More gibberish. You ain’t go a clue. Please point us to a detailed and viable plan for a revenue neutral carbon tax. With numbers and dates. I have not been able to find out what the undercounted damages look like over the 300 year period. It is entirely possible that they increase twentyfold by century, or much more. Especially if economic growth exceeds the discount rate. Has anyone seen the total 300 year undercounted damages for a ton of today’s CO2 emissions according to SCC? Why is that not published? Perhaps it is unrealistic. Probably more likely it converges by 300 years, so there is no point going any further, otherwise they would have. At twentyfold increases in damage per century, pretty soon you are talking about a global GDP debt which is global devastation. As I read the SCC documents, global devastation (aka catastrophic) is one of the probabilistic scenarios and it contributes significantly to the discounted cost. There are many papers on the social cost of carbon, and some publish the info you seek. The code for key models is also in the public domain, so you can reconstruct intermediate results. And the EPA, of course, has archived their work for the InterAgency Working Group. The social cost of carbon is a marginal of a current. After 300 years, most of the CO2 emitted today is gone from the atmosphere, and little additional climate change is caused. Undiscounted, this is second-order stuff. Discounted, third-order. Thanks Richard, can you suggest an article or two? However, almost all of the CO2 emitted in a given year is gone in just 5 years, so I am not sure what you are saying in your second paragraph. If you are referring to the ppm increase that is supposedly attributable to the emissions then how does that ever go away? Do the IAMs have the CO2 level dropping back to the pre-industrial level in 300 years? It’s a marginal: The first partial derivative of concentration at time t+s to emissions at time t.
Thanks for the link Richard, but 100+ papers is not what I am looking for, which is just a chart and a number. The chart shows the damages for each year (or decade, or some interval), while the number is the total damages, for one ton of today’s emissions, over the 300 year period of analysis. I assume that in order to get discounted damages we have to have undiscounted damages by time. But then, economics is not my field. How are the policies determined to be Draconian if determining their net cost is absurd? Or how is there net cost assessed if the the SCC cannot be determined? The absurdity is claiming to know what the world will be like in 300 years. As far as I can tell, not very many people are claiming to know what the world will be like in 300 years – but instead are trying to outline probabilities and associated risks within ranges. I will say, however, that you seem to be an exception: As near as I can tell, your pronouncement about what will or won’t be Draconian rests on a 100% certain conclusion about the future. The US NAS (National Academy of Sciences) has a two year project underway to evaluate SOC models. They’ve had two dozen meetings so far, mostly closed-door but a few open. For a few meetings some presentations and notes have been put on line (for example, see http://sites.nationalacademies.org/DBASSE/BECS/DBASSE_169040 and a video of a meeting this year at https://vimeo.com/194393565 ). Note the comments in the first meeting by Nordhaus and the presentation by Mendelsohn. However, we must recognize that the research base for impact/damage studies is very thin. Outside of agriculture, sea-level rise, and a few other areas, the research on impacts is vanishingly small relative to its importance. It is clear that the highest medium-run priority in refining the SCC and indeed the whole policy and integrated assessment effort is to improve the research base of impact studies. I wonder why there has been so little research effort – during 30 years of climate alarmism – to actually get the primary evidence needed to support the alarmists’ beliefs. I suggest, if the evidence was there to be had, the researches would have been out there getting it and debating it. Science could have been done, instead of swamping us with ideological dogma unsupported by valid evidence. Does not support the contention that an increase in GMST is likely to be net damaging. There is already a great deal of research on all the terrible things that extreme warming might bring. Wasted money. We do not need more in order to “refine” the already absurd SCC numbers. I expect the NAS report to be just as silly. SCC needs to be repudiated, not refined. This isn’t an issue that can be handled by the national Academy of Sciences anyway. They lack the expertise and resources to do a half baked job. The problem with this whole topic us that it seems to be handled by scientists or scientist controlled outfits. That’s like trying to build a bridge over the Amazon River with 8 year olds who have Lego experience. What this requires is a gigantic multidisciplinary team with a 10 year deadline and $100 million a year budget. This could end up being larger than ITER, the ISS, or the war on drugs. By the way, the video is of the last meeting of the committee. Their report is expected to be finished by the end of January, 2017, so there will be no input from new staff of agencies like the DOE or EPA under the Trump administration. The NAS has produced a steady stream of alarmist reports. It will be interesting to see if they back off a bit given the new politics, but I do not expect it. I don’t expect it either with Myles Allen and Robert Kopp on the committee. I read an excellent analysis of IAMs by Robert Pindyck of MIT on the Internal climate variability post. It was an eye opening experience for me. Given the number of assumptions and basic guesses involved, I dont know how anyone takes that process seriously. Also, Judith tweeted earlier today about a paper covering the biases in SST and current plans to improve the entire effort. Denizens are familiar with the inherent weaknesses in historical temperature collection using wooden and canvas buckets and various other methods but I wonder what confidence the public would have in the reliability of historical SST if they knew how primitive early efforts were in establishing a baseline temperature record. Efforts have been made to modernize methods for recording current temperatures, but any adjustments to older records still will not reflect reality. Guesses will still be guesses. I can’t help but think anyone uninitiated in climate science would question how so much weight has been put on such a frail foundation. And these are just the latest two examples. Why is there no consideration for the positive aspects of CO2? Such as the increase in plant growth. At least one of the three SCC IAMs (Tol’s) includes this benefit, giving negative damages in the short run, but these are soon overtaken. Well, I for one find this whole “Social Cost of Carbon” discussion quite discriminatory. Why no discussion of the “Social Cost of Oxygen” ? Boy, if you want to talk about a destructive chemical element with lots of “costs” associated with it you should concentrate on Oxygen. Dang stuff rusts Steel constantly. Build a nice strong steel bridge and you have to put enough extra steel in there ahead of time to account for all the steel that will rust away due to the Oxygen…. Heck, a whole industry was created to try and reduce the “Social Costs of Oxygen”, yeah, that would be the “Paint Industry”. Henry Ford said you could have one of his cars in any paint color you wanted as long as you wanted Black. Rumor is that the black paint dried faster than other colors they tried. General Motors made early inroads against Ford’s dominance by simply offering cars in other colors. And boy oh boy you don’t want any of that nasty oxygen anywhere near something that is burning, ouch that really hurts. I’ve heard they can even “burn” steel with a fancy thing called an “Oxy-Acetylene Torch”. Sounds way too costly to allow the use of that at all…. Sounds like what we need is a comprehensive cost/benefit analysis for all chemical elements. What good things they can be used for and what bad effects do they cause. Oh, wait, I think the chemical engineering community has been working on that for a century plus. Probably why you never heard of the “Argon-Neon Cutting Torch”, it “costs” almost nothing, but it cuts really really really slowly….. I am a non-expert, just having 15-20 college science courses 40 years ago. I don’t know who to believe, the people who say we are having the hottest years on record or those who say we have not had significant warming for 15+ years. But it seems to me that if the Alarmists are right, and in the terms they put it in, how any non draconian measures could have enough impact, in time, to avert disaster. And if we implement draconian measures it will impoverish most of our seven billion people and cause massive political, social, and military upheaval. Perhaps we should be focusing on how to live on less land, with lots more air conditioning, and renewable energy, like fusion power. We should be fretting less about GMOs, and learning to manufacture, meats, fruits, and vegetables from scratch, so that these additional folks, with less land can eat. And of course we should focus on doing everything, everywhere, with less pollution. Hottest year on record in US only because the 1930’s were cooled by adjustment. For GAST the statement is unknowable because of SST uncertainties. The climate gate emails pointed out the the entire southern ocean south of latitude 30 south was essentially unknown until ARGO. Speculations at best and furthermore biased and rounded upward by an exponential factor! It should be noted that the social cost of carbon has a precise technical meaning: It is the net present value of the future marginal impact of current carbon dioxide emissions. My discussion with Willis Eschenbach is mostly about Willis and others not understanding that definition. Discussions about the social cost of carbon typically overlook one key point. This cat is out of the bag. The social cost of carbon has been estimated. In fact, it has been estimated well over 1200 times. The social cost of carbon has been locked into policy in the USA and, to a lesser extent, in the EU and Canada. You cannot wish away the social cost of carbon. It is here to stay. You can lament the quality of current estimates of the social cost of carbon, but the aim should be to improve said estimates. Sadly, the social cost of carbon is one of those areas where considerably more time and effort is spent on assessment (a polite word for bitching) than on research, the forthcoming NAS report being just one example. Note that estimates of the social cost of carbon are necessarily uncertain as it depends, by definition, on projections of the future — and not just on projections of the climate system but on projections of everything that affects the climate system or is affected by it. The question is not whether we should do this. The question is how to do it, and how to build confidence in what we did. This comment contains the other questions I referred to in my first comment (which is currently awaiting moderation). 1. Have any substantial changes been made to the results plotted in Figure 3 since this paper was published? If so, could you please post a link to where I can refer to it? 2. Regarding the energy line, is it solely from projected increases in energy consumption that are attributable to global warming, or does it also assume increases in real energy prices? 3. If it is partly based on assumed energy price increases what proportion is due to price changes? 4. Do you have a chart of the energy line assuming, a) constant real energy price and b) assuming the long term (e.g. 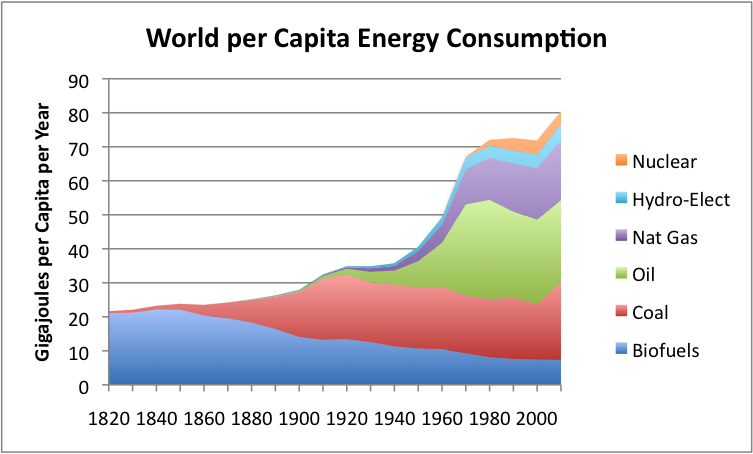 since 1800 or 1900) trend in real cost of energy continues to 4C increase in GMST? 5. Have you charts showing sensitivity analyses of the effect of price changes on the energy line in Figure 3? I understand Anthoff and Tol (2011) ‘The Uncertainty about the Social Cost of Carbon: A Decomposition Analysis Using FUND’ https://www.researchgate.net/publication/238597107_The_Uncertainty_about_the_Social_Cost_of_Carbon_A_Decomposition_Analysis_Using_FUND , Table 4, shows ‘Curvature cooling energy’ is the most important parameter. I assume (perhaps wrongly) this means that SCC is most sensitive to the impact of energy cost to increasing GMST. Is my understanding correct? I don’t know how the real cost of energy has changed over the past one or two centuries, but I understand there was a substantial cost increase in the 1970s. 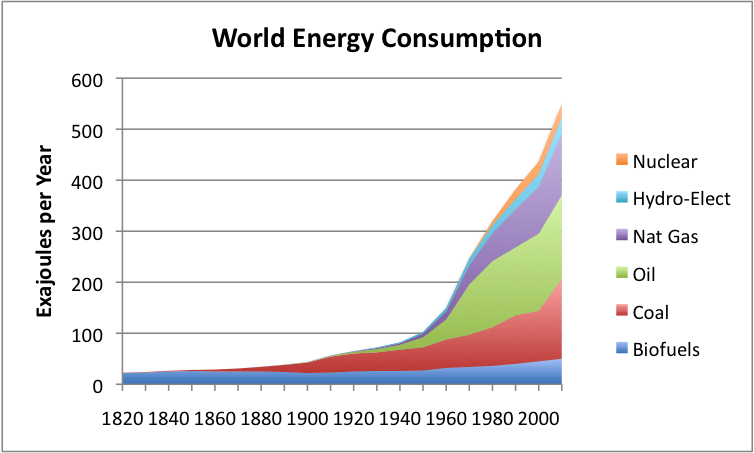 Vaclav Smil (2010) http://www.vaclavsmil.com/energy-transitions-history-requirements-prospects/ estimated global energy consumption since 1800 (see below charts). The charts show disruption to the energy consumption growth rate occurred in the 1970s. Using the long term energy price trend, over one or two centuries (which I don’t have), would reduce the impact of the 1970’s disruption and, I suggest, be a defensible assumption for projecting the future price of energy. We can certainly change how the SCC estimates are made or used in Federal decision making, including banning their use. For example, OMB can limit the time horizon to 50 years, or require a 10% discount factor, or even mandate a specific CO2 sensitivity. Cost benefit analysis methods are already regulated. I think the uncertainties are so great that a ban on using SCC is in order. We do not even know that significant AGW exists, so it’s impact clearly cannot be quantified. As someone reasonably schooled in the dark arts of public policy I’m doubtful of the utility of a social cost of ghg for designing effective interventions. The argument is that is you can quantify the net externalities of ghg emissions that gives you some basis on which to take measures to internalise them where they may be controllable. Taxes are preferred because of their relative efficiency. However the primary public policy problem is not the fact of ghg emissions and their externalities, it is the uncertainty that surrounds them. This uncertainty significantly changes the nature of the most efficient intervention. The risk in imposing a tax, even progressively, is that the world might not (definitely won’t) turn out that way. Instead this class of problem is better dealt with (and more usually dealt with) in a more targeted way dealing with big ticket items (where the externalities are clearer) and develop interventions incl. incentives that are adaptive to circumstances as they evolve, and that allow appropriate options (including wait and get more info) to be exercised. Quite apart from anything else interventions that use uncertain abstract notions of social cost won’t support the public consent required for the necessary long-term interventions and sound public policy. The US way well be seeing some of this as I write. I am not going to disagree with anything you said. But I wonder if Willis and others not understanding net present value of the future marginal impact of current carbon dioxide emissions is the real issue for them. I won’t pretend to speak on their behalf, but discounting and net present value as a concept is extremely simple. The complexity is in the execution making yourself believe estimates will eventually reflect reality. There is nothing wrong with establishing estimates and using assumptions as you see fit, but with one caveat-don’t take yourself too seriously. Just one little tweak and you get vastly different answers. You are correct in saying “You cannot wish away the social cost of carbon. It is here to stay.” But in using those calculations in the formulation of public policy, the very first thing one needs to do is to first wipe the smirk off your face and then stop with the eye rolls. After that, you can get down to business. The entire process needs to be taken with a grain of salt and not get caught up in the weeds and forget the overall purpose in arriving at a sane policy using realistic tradeoffs. Sometimes that has nothing to do with formulas and equations. A new movie is out this month to some acclaim. It is entitled “La La Land”. That is about where this whole debate is located. Thanks for your comments of clarification. I believe that you have exhibited a high level of integrity and expertise in this area, and I appreciate your openness. Having said that, I have no more confidence in the GCM or IAM models than I would have in a 200 year model of the Dow Jones Index. I know economists can model everything. (One of my favorites is the “Neo-Atlantis” paper by your colleagues at the VU who modelled which areas of The Netherlands it would make most economic sense to abandon should sea level rise reach 5 meters by 2130. Luckily I lived and worked for six years in the “saved” part, so needn’t worry should I live so long). In your 2015 working paper, you mention that the SOC calculation relies in part on a judgment about whether or not Bangladeshis are fatalistic about rising sea level (attributing flooding to an act of Allah and therefore not worth taking action to reduce damage risk) as opposed to some others who think they can take action to reduce harm. Leaving aside of whether there is sea level rise in Bangladesh not attributable to subsidence, whether adaptation can reduce impacts (as studies already show), the extent to which silting may offset sea level rise, and the rate of future development of Bangladesh, my question is this – how rational is it that a company or consumer in Des Moines or Devon needs to be charged a tax based on a theoretical minor contribution to some potential modelled harm halfway around the world? As you know, the recent US Court of Appeals for the 7th district upheld the DOE’s use and calculation of their SCC model, and explictly agreed with the DOE’s analysis that used a global impact measure, not US. That means that a SCC model that shows some harms in say, Bangladesh, can be used to impose a US tax, even if it shows some benefit in the US. As they said “DOE acted reasonably when it compared global benefits to national costs”. Even Cass Sunstein has calculated using current models that the SOC in the US may be as low as US$ 5/MT or even less, but because their might be some global disbenefit, potentially based on poor social attitudes over which we have no control, the calcluation is still “legitimate” under US law. It has been wisely said that “all models are wrong, some models are dangerous”. I would put the SCC/IAM models in this category. You are right there is a strong structure in place that cannot be easily overturned. Nevertheless, I agree with Pat Michaels on this point – “Given the uncertainties that are involved, the OMB [and NAS, DOE, EPA, etc.] should not act to update the current SCC determination, but rather to discard it in its entirety”. benefit–cost practice by U.S. government agencies sums the benefits of a policy across the political jurisdiction whose citizens will bear the cost of the policy”. However that’s not what’s being done for the Social Cost of Carbon (SCC). In the current practice for SCC calculations, the costs analyzed are only US domestic costs, whereas the “benefits” are calculated globally. That’s why in such calculations, we have to estimate the likelihood of Bangladeshis to undertake adaptation measures and not to be “fatalistic”. So real costs are being imposed, based on theoretical costs to future (yet unborn) people halfway around the world, based on a guess of their supposed philosophy of life, and theortical harms which have not been demonstrated. This strikes me as lunacy. Good point. It’s been said hundreds of times before, but it needs to be continually repeated because most people either don’t get it, don’t want to, or prefer to ignore it. Yes, the greater the number of conceived indirect effects, the greater the number of compounded sources of error for each indirect step. The greater the duration ( 300 years? Really? ), the greater the compounding of the errors. These estimates would appear to be worthless. Especially given that the models can’t even model three decades of climate. Note that’s climate, not global mean temperature. Given TOA RF consideration, GMT may well be predictable ( +/- ). But GMT is not climate and does not tell you anything about lots of the assumptions that are erroneously in the SCC speculations ( storms, droughts, floods, etc. ). It’s entirely possible that the sign is wrong for many of these assumed effects. One possible exception to the limits is Sea Level Rise, but even there I find great fault with the assumptions. One could calculate the value of all buildings less than 10 meters above sea level and say: ‘Gee, this value is at risk from 300 years of climate change’. But that would be wrong. Most buildings are what? Perhaps 50 years old? People tear down old buildings and put up new buildings. Constantly. This nonsense comes from political speech and imagined, not real harm. Willis understands your definition. And thinks it wrong per the links Judy added to the head post.. The trick lies in your definition of ‘future marginal impact’, where all the negatives but not all the positives are guestimated in at least some of the IAMs. As simple examples, neither refrigeration nor indoor lighting is possible without carbon dioxide emissions since renwBles are intermittent. Agricultural equipment emits CO2 since run on diesel or gasoline. Without it, food production on requisite scales to prevent mass starvation would be impossible. Feeding the worlds growing population is a marginal impact, but only negative if you think (like Ehrlich) that the population should shrink; mass famine would do that. b) if there are to be controls, whether the policy instrument should be a price mechanism (putting a price on carbon) rather than non-price mechanisms (regulation). 1. Like it or not, the world is going to have climate policies, so it is better that they are price-based rather than regulation-based. 2. The key issue is that costs and benefits should be properly balanced, which they are not in current climate policies applied by most countries (certainly in the EU and USA). A price mechanism would help to make the trade-offs transparent and make evidence-based policy more likely to develop. I accept this is a political judgement and I may be wrong, but if transparent price mechanisms are developed then surely stakeholders in the policy debate (and not just the green lobby) will not be shy of putting their percieved costs and benefits into the mix. 3. Maybe this could even be the basis for a broad coalition for more balanced and, in the long term more stable, climate policies. 4. Mainstream calculations of the SCC start low and rise gradually over time. Why aren’t sceptics welcoming this as a counterweight to the dominant IPCC mind-set of large early emission reductions? 5. If we treat current climate policies (including subsidies for alternatives to carbon) as implicit carbon taxes, they are probably already higher than mainstream calculations (Tol/Nordhaus) of an optimal carbon tax would suggest. So if we follow a carbon price route, policy should not be tightened for several decades. As far as the UK is concerned, I calculate that current policy is above estimates of optimal SCC until well beyond 2050 even if fuel duty in the road transport sector is diregarded (which is obviously the big one). Here’s how stupid we’ve become. Most causes of premature mortality and morbidity are preventable ( diet, smoking alcohol, activity, sexual practices ). Weather events are so insignificant to mortality, they don’t even make the list. Climate change as a marginal change in weather is even less significant than absolute impacts from weather. So, people are a much greater risk to themselves than climate change will ever be. That’s how stupid we’ve become. Why? Could you please read and consider this and let me know if you still believe a price of carbon can succeed? Yes I have seen your post. You make a powerful case that costs of proposed climate policies exceed benefits at least for several decades, probably longer. My point is about policy mechanisms, not about the tightness or otherwise of the policy. A market based mechanism makes it easier to make the trade-offs between costs and benefits and more likely that this will be done rationally. You say “the cost of reducing greenhouse gas emissions by carbon pricing outweigh the benefits in terms of reduced climate damages for the foreseeable future.” If this is correct, which I believe it is, then it is true of any efforts to reduce emissions, whether they are achieved by carbon pricing or by other mechanisms. What the price mechanism does is to allow us to make the cost/benefit trade off explicitly and with a common numerator: value. You rely on precisely this calculation to make your case that policy costs exceed benefits. Why should that not be the approach adopted by governments? The other strength of the price mechanism is that it allows market participants to respond to price signals in the most efficient way, rather than relying on governments and regulators to choose the outcomes. In effect you are arguing that the carbon price should be zero or negative, relative to current policy, for the foreseeable future. Good: make that case and carry on using the SCC calculation to do it. Your political argument is that “nations are unlikely to agree to carbon pricing simply because the costs exceed the benefits”. The point is that they are busily agreeing to non-price policy mechanisms which do just that. But the cost/benefit comparison is not being made. I’m not naive enough to think that a transparent, rational basis of calculation will automatically lead to good policy, but I’m pretty sure that not having one only contributes to bad policy. I’m willing to take the risk with the market. 1. This would only work if the price could be negative so that, if SCC is negative, GHG emitters are subsidised the SCC amount per tonne they emit. This is plainly absurd, so will never happen. Clearly, we need to establish whether or not GHG emissions are doing harm before we proceed with policies that will definitely do harm. The first and most critical step needed is to greatly narrow the confidence intervals on the estimates of SCC. For that we need research to get the evidence needed to define, calibrate and validate the damage function. 1. re negative carbon prices: SCC calculations allow for a level at which (marginal) abatement costs exceed projected damages so the SCC is negative. Whether that should lead to a reverse subsidy is another matter. There are all kinds of externalities in economic relations, positive and negative, but if we tried to recover them all the market would come to a standstill. For example, low cost energy has led to very large positive externalities over the centuries which have improved productivity in industry and agriculture. The argument for paying for (or recovering) externalities should apply only to very limited circumstances ie where there is a demonstrable market failure. Or it’s just a political decision. If the SCC can be shown to be negative at current levels of abatement (and bear in mind that your excellent chart of net benefits for various abatement paths refers to benefits relative to the 2010 policy stance) then I’d be content to freeze policy at current levels but to steadily transfer all policies to a carbon tax, or at least to cost them on a common basis, ie to treat renewable subsidies as implicit carbon taxes. 2. compliance costs: in reality of course, participation will not be anywhere near 100% so the optimal tax should be reduced accordingly. Every tax system has compliance difficulties and I’m sure a carbon tax would be more difficult than most (though I for one would be happy if we missed out the goat herders). I’d definitely agree that the priority should be to improve the quality of information on the correct level of SCC. But this doesn’t have to be entirely sequential; ie we don’t have to work out the perfect SCC before deciding to implement a tax at all. Indeed we’re more likely to establish good quality data if people accept it’s actually going to be used for something, as opposed to just scoring points in a political shouting match which is more about justifying climate alarm than it is about informing policy. My broad point is that the alternative to a carbon tax is not no policy. It’s the mess of current climate policy. My judgement, and OK, it is a judgement, is that we’re more likely to build a coalition of support for rational policies if we embrace market mechanisms than if we appear to stand against them. If GHG emissions are doing more good than harm, then any policy to mitigate GHG emissions is doing even more harm. No, I do not assume that GHG emissions do more harm than good, nor do I assume that damages from emissions exceed abatement costs, at least at current levels. I do think it is reasonable to assume, though, that we could reach a point in the future where that is reversed. I also think that climate policy is, or should be, primarily about dealing with uncertainties, including tail-end risks that damages could be higher. Again, though, these risks arise in the long term (mostly in the very long term – centuries rather than decades). Part of the attraction of a carbon tax is that it allows you to adjust policy in the light of actual outcomes. That said, whether I think costs exceed benefits shouldn’t matter to whether I support a carbon tax. That trade-off affects the level of the tax (including whether it is negative or zero), not the principle. The point of a carbon tax is not to determine a given level of emissions. Rather, it is to put a price on carbon and then let the market decide what to do about it. Market participants can decide to reduce their emissions, they can decide to pay the tax and carry on emitting, or they can adapt. As it happens, I believe that a carbon tax in current circumstances would be very low or zero, especially bearing in mind the fact that participation would be nowhere near 100%. And if we calculate current policies including subsidies to renewables as implicit taxes on carbon then in many if not not most cases it would imply there should be no additional carbon tax at all. Equally, though, I could be wrong and someone else could demonstrate that a carbon tax should be higher than I believe. I’m willing to take my chances; I certainly think this would be more likely to lead to sensible outcomes than the current way climate policy is made. Your comment I responded to suggests that assumption underpins several of the thigs you said in that comment. To justify that assumption one needs valid evidence to demonstrate it, not simply assume it. That’s why one needs a value for the cost of GHG emissions. The same applies to any policies to limit genuine, harmful pollution. That said, whether I think costs exceed benefits shouldn’t matter to whether I support a carbon tax. I don’t know how you can support that statement. In that case you can argue to tax anything you want just because you think it is “bad”, on the basis of no evidence what so ever. Why? Just because 30 years of dogma has convinced you it is harmful? In which case you would be doing enormous harm to human well-being for no benefit. Have you estimated the compliance cost? Did you read the link I gave in another comment on the compliance cost? Do you realise the climate industry is currently running at about $1.5 trillion per year? especially bearing in mind the fact that participation would be nowhere near 100%. Do you understand the penalty to participants if participation is less than 100%? Do the IAMs relate damages (economic loss) to increase in GMST or to change in average regional temperature? If the latter, do the IAMs compute a benefit for increasing average temperature in mid and high latitudes? which allows for greater losses when T is large. I may misunderstand what is meant by “relate the temperature increase T to GDP through a “loss function” ”. It seems to me an increase in average temperature in mid and high latitudes may be net beneficial and the benefit would be greater at high latitudes. The loss in the tropics might be small (e.g. because a 3 C increase in GMST amounts to only about a 1 C increase in the tropics). Therefore, I would expect the damage function should relate to latitude, starting temperature, change in temperature, land area at the latitude and possibly distribution of GDP per capita at that latitude. Perhaps, FUND handles all this. Could you please explain or provide a link to where it is explained (for the non expert). Hee-hee. Looks like the sign may be wrong. Figure 2. The national total annual impact of climate change expressed in welfare-equivalent income change for a 2.5˚C global warming (relative to pre-industrial times) as a function of per capita income (top panel) and temperature (bottom panel). However, this chart doesn’t seem right to me (refer to my first reply to your comment here: https://judithcurry.com/2016/12/30/discussion-thread-social-cost-of-carbon/#comment-832472 ) . I would expect the economic impact in countries with average temperature below ~15˚C (or even 20˚C) would be net beneficial, not negative. The countries with high temperatures are in the tropics where an in increase of 2.5˚C GMST amounts to less than 1 C average increase in the tropics. Is your Figure 2 a plot of 2.5˚C change for all regions and countries or is it the expected change per region for a GMST increase of 2.5˚C? Could you please clarify this. Thank you for your comment. I have some questions I would like to ask you. This comment contains my first question. I’ll ask the others in a subsequent question. I’ll repost from a previous thread (https://judithcurry.com/2016/11/25/week-in-review-science-and-policy-edition-3/#comment-826494 ) three charts and my comments that explain three of these four dot points. The three charts below show Global Mean Surface Temperature (GMST) over the past 540 million years. I infer these do not support the contention that a 3C rise in global average temperature is a significant threat, let a alone 2C rise. Scotese’s Figure 15 shows the GMST over the past 540 million years (Ma). We can infer that if GMST increased by 3C (i.e. from ~14.5C to ~17.5 C), it would be similar to what it was about 35 Ma ago; and below the average GMST over the past 540 Ma and below the middle of the temperature range over this period. Does this suggest a 3C increase is a significant threat? ( consider this figure together with Scotese’s Figures 12 and 13, below). Figure 15 also shows the planet is currently in only the second deep coldhouse phase in the past 540 Ma, and near the coldest. Since life thrived when the planet was warmer than now but struggled when colder, what is the evidence that 3C warming is a significant threat? What is the empirical evidence GHG emissions will do more harm than good? 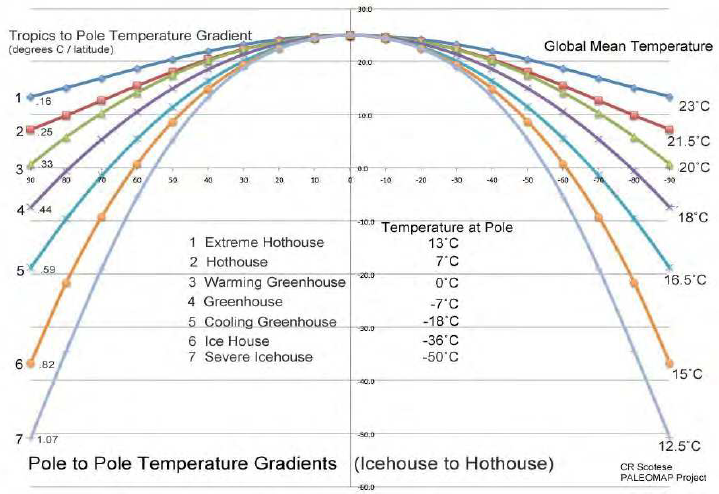 Figure 12 shows that, if the GMST increases by 3C, from the current ~15C to ~18C, the average temperature at the poles would increase from -36C to -7C, and the temperature gradient from tropics to poles would decrease from 0.82C to 0.44C per degree latitude. That’s likely to be a significant overall benefit for the mid and higher latitudes. 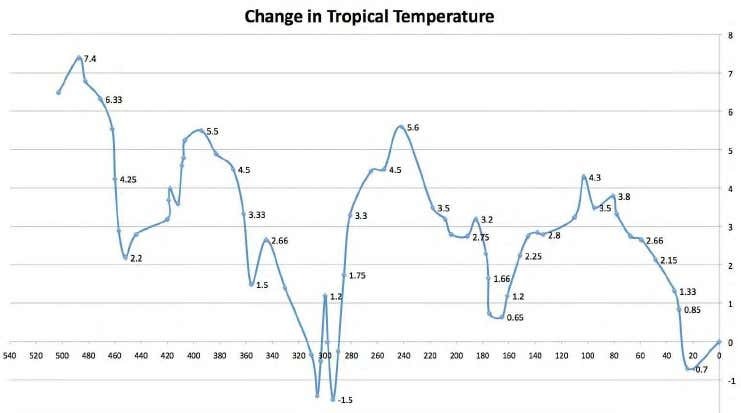 Figure 13 shows the change in average temperature of the tropics over the past 540 Ma. It shows the average temperature of the tropics 35 Ma ago (i.e. when GMST was about 3 C higher than now) was just 1C higher than now. These three charts, taken together, suggests a 3C rise in GMST means a small (~1C) increase in average temperature of the tropics and a beneficial warming of the mid and higher latitudes. These do not seem to me to support the contention that global warming or GHG emissions are a serious threat. Yes, there are numerous bad/wrong/erroneous terms in these things before even getting to economics. 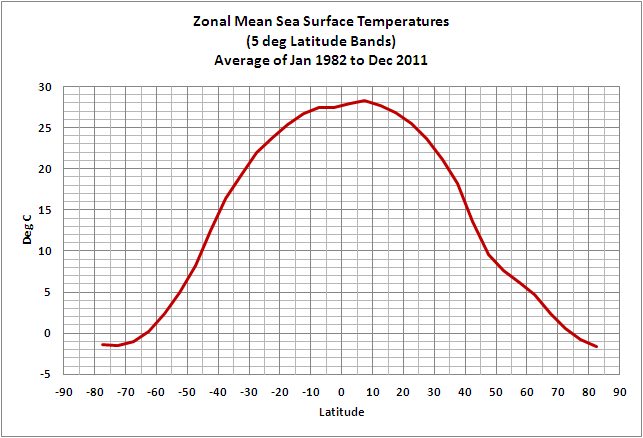 Even if one knew GMST change, GMST obscures the “shape” of that warming ( winter versus summer, poles versus tropics ). And GMST by itself doesn’t cause much harm. These estimates are quite dubious and probably worthless, but since they’re not in any way verified, make a smashing headline and great justification for power hungry politicians. Probably worthless but assumed correct. Let’s get it right, there is NO social cost of Carbon or Carbon dioxide, both are essential components of life on this planet. There may be a Social Cost of policies from badly informed or money grabbing (taxation) governments based on the misleading and possibly co rupt quasiscience. Totally agree. It’s a fabrication – a term they invented so they could charge us yet another tax. It’s pure fiction. In two sentences you condensed all of Peter’s multiple paragraphs to the main point. No offense to Peter. It is obvious you have put a great deal of effort on this subject. You are missing the really important point. The value of SCC is that, if it is grossly over stated, as it seems to be, then correcting the value of SCC is the way to demonstrates that GHG emissions are not a major threat to the economy and we can and should move on to more important issues – like restoring world GDP growth. Correcting SCC has the potential to bring the whole climate alarmists’ doctrine to an end. I suspect that may be why my questions are being avoided by the believers of dangerous climate change and the advocates of carbon pricing policies. (I may be wrong, but after several years of these same questions being dodged by those who hold these beliefs and promote carbon pricing, it seems to be a reasonable interpretation). The key point is we should use SCC to show GHG emissions are no a serious threat to the global economy, let alone to civilisation. Not renounce it as absurd. That will simply be dismissed as the beliefs of a fringe group of extremists and deniers. I would submit that what needs to be demonstrated is the harm and devastation that CO2 has caused, then we can all sit down at the table and decide what to do about it. Devising some esoteric and complex SCC model because all the all the global climate models show increasing CO2 over the next few centuries and ‘you know what that means’ is simply fallacious. BTW – why do all the model show inordinate warming? In addition, where is all the sea level rise and concomitant devastation, where is that ice free arctic, where are those Cat 5 massive and destructive hurricanes, where are all those increased and overwhelming droughts impacting agriculture. Incidentally I can tell you that I must replace 5-8% of my vines (noble grapes) after every winter (sometimes 5% sometimes 8%) – and I’m quite confident that is not secondary to a rise from 385ppm to 400ppm of CO2 in my atmosphere. Nevertheless I am stuck paying a carbon tax instituted yesterday – all for what? I doubt either of us has missed your point. You make it almost impossible to miss. Won’t speak for Vukcevic but I not only get it, I agree. My new year’s wish for you is that you find a way to remove that dowel rod. And if you do, pass the means on to Mr. Segrist. Your article is welcome and appreciated as an analysis of a problem that most of us are or should be aware of. My comment is a short and to the point remonstration against the UK’s government’s rip-offs. Green taxes on consumed energy and travel with the additional taxpayers’ subsidies for so called ‘renewable’ energy have gone far beyond what is reasonable. I would add that ‘carbon’ terminology, as in the current usage, is inappropriate and needs a re-think. Thank you. I agree with the points in your comment. I told you we should be careful who we gave those cumputee thingy’s to. In these kind of speculations, is the benefit of the use of energy included? The frustrating aspect, beyond the unverifiable timeframes and dubious assumptions of climate change and impacts is that we’re already observing some of the formative ( and probably much more predictable ) economic aspects. Economic development has clearly led to falling population rates (and increasingly falling national populations ). As economies have advanced, birth control spread, the economic motivation toward children has decreased rapidly. What possible causes would reverse or even slow this trend? Technology has led to dramatic increases in energy efficiency. What possible causes would reverse or even slow this trend? Appears to those considering these aspects that long term CO2 has never been a problem. Yes, these trends are taking place and a major problem to be addressed in all developing countries is decoupling emission growth from GDP growth. This is the aim of IPCC targets, and it is already starting to some extent with US and EU emissions decreasing while GDP grows. The misguided notion that reducing emissions necessarily collapses the global economy is being debunked by the trends. I would suggest a good proportion of American emissions reduction is due to going over to fracking. The EU looks on that energy source as akin to how a vampire would view a cross, with horror and terror. So EU reductions is partly due to a poorly performing economy as well as natural efficiencies that comes with technology, whilst both areas have probably ‘benefited’ by exporting heavy co2 belching industries outside of their borders thereby reducing their own emissions but increasing it elsewhere. The important sectors of energy production and transportation can both progress as fossil fuel usage gets replaced and/or efficiency increases. This is the encouraged direction. Global emissions are peaking now or soon at around 40 GtCO2 per year. We are unlikely to see 50 Gt and more likely to see 30 Gt again as the future unfolds. Some sticklers don’t see that as at all possible with GDP growth, but I see it as highly possible. Renewables are a mature enough technology to not to have to rely by now on massive subsidies. Its achilles heel remains suitable storage when there is an excess of power. So as yet there is no evidence that renewables can replace fossil as a base power. There is perhaps a long transition phase that is now in process which would include gas and fracking and nuclear, but until suitable storage comes along renewables will remain the very poor relation to its grown up brothers and sisters except in some favoured locations. The motivation for technology to advance in these directions is given by rising CO2 levels and the more uncertain future that leads to. I heard that the UK is now only 50% fossil fuel in its energy production which is a good sign. Coal is generally a declining energy source here. It is considered the devils spawn by the same people that thinks its Ok to import wood pellets from the US for DRAX. Our power generation is on a knife edge, a cold winter would cause enormous problems as we have no spare capacity due to coal being phased out. The govt has belatedly realised that and has stationed giant diesel generators around the country for emergency use , so that will be very environmentally friendly if they have to cough into life. Our over reliance on Sun (sun!! In the UK!!) and wind is all the more perplexing as we have unlimited sources of renewable energy lapping round our island in the form of tides and waves. Nuclear energy makes a lot of sense if they can get over their issues with China. The motivation for technology to advance in these directions is given by rising CO2 levels and the more uncertain future that leads to. Free market motivations toward cost and convenience drive technology. Smart phones are super computers but efficiency was driven because of the desirability of portability. Government doesn’t mandate technology, market forces do. Government mandates lead to INefficiencies and economic stagnation. Pricing in externalities is part of a free market solution. Yes. But to the OP, the present externalities are imagined to be positive – meaning a negative price of carbon? Future externalities imagine a range of scenarios which may never occur – what’s the point in speculating? Human population is likely to peak around 2050, and its difficult to make a case it will ever be exceeded again. Technology would seem likely to continue to bring efficiency – what case for decreasing efficiency could there be? Consider these factors and the extreme claims of harm would appear to be an intellectual embarrassment. On short-term externalities, that’s like saying smoking has the short-term benefit of relaxing you, and forget the long-term. Fossil fuels are like drugs. The world has to get off them sooner rather than later for its own health, and this need is already driving a lot of innovation. That is in addition to the need for clean air, and facing oil and gas having limited supplies. Energy independence also has security advantages for nations. There are many things driving this, and the IPCC is only one. You say fossil fuels are like a drug. You are aware that drugs have improved, lengthened, and saved billions of lives, right. You believe they have side effects. Fine. So do the majority of drugs. In the end it comes down to weighing those side effects against the benefits. Who you stop taking a drug which was keeping you alive, because it made you nauseous much of the time? More to the point, would you prevent someone else from taking such a drug? Essentially that is what you advocate in your crusade against the devil fuels. It certainly is a slow process to get off the fossil fuels, and no one advocates going cold turkey, yet many like yourself irrationally fear, or some even fearmonger, that is what is being called for. It could take 50 years or more according to all the timelines presented, and technology advances a lot in that time especially with incentives. I’m calling BS Jim. What irrational fear have I expressed? I’ve never said I was against a Carbon tax, just that the details were important to know before implementing one. Subsidies are another topic you haven’t heard me rail about. All I’m saying here is basing any sort of tax on extremely flawed methodology is not rational, unless your objective is something other than climate change. The person who exhibits irrational fear is you. You are certain great harm will result, with little real evidence to support such harm. You seem to fear trying to phase out CO2 emissions in a 50-year timeline. If not, then we agree there is nothing to fear in that, and just let them carry on with it. Or you may prefer they stop trying to phase out emissions to stabilize the climate, and just allow hundreds of ppm to be added by 2100 with it continuing to rise past that date. I find it doesn’t happen for “skeptics” to state that they really want such large changes in our atmosphere, and they usually just change the subject when asked if they explicitly want that in preference to stabilization. For me the prospect of 700 ppm and rising in 2100 is far more fear-worthy than the entirely possible 50-year phase-out of emissions to stabilize us below 500 ppm. Big house of cards. We don’t even have climate models which are fit to tell us what sensitivity to co2 is. None of them have any predictive value. Warming effect of CO2 is Negative? .05? 6 degrees C? Is warming good or bad? All agriculture would cease on the northern plains and Canada with just a few degrees of cooling. I want oxygen credits for all my trees and grass and gardens! What the most vocal Denizens here at CE consider an objective discussion: (1) They create their paradigm. (2) Only a discussion and questions within their paradigm is valid — anything else is called a dodge (with sophomoric name-calling). Only their paradigm can possibly be right. With today’s SCC discussion, yet again we have the above playing out here at CE. The paradigm that leading Economists on the SCC is its primary “context” — the application of SCC in international trade (called trade-clubs). In the past, when I’ve raised this international trade aspect here at CE (a paradigm used by leading World Economists), there has been no objective comments to this “big picture view” of the SCC — say, to discuss why China is implementing a carbon tax? Is China positioning themselves on implementing international trade Climate Clubs? Your analogy of using IAMs generated SCC as a basis for policy making to an enormous global environmental impact assessment (EIA) is a good one. A large infrastructure (for lack of a better term) of consulting companies has developed and thrived to feed the bureaucratic monster demanding environmental impact assessments for everything that is proposed to be built. Not only do these assessments look at potentially real environmental impacts such as degradation in water and air quality, they have become the favorite mechanism used by environmental activists to block anything, anywhere, anytime. The modeled impact on so-called endangered species like prairie chickens or snail darters or silvery minnows is used to routinely stop or delay projects. When not able to stop projects outright, EIAs are used to impose costly constraints and longterm monitoring projects that feed the coffers of the consulting companies that perform the EIAs. Talk about a conflict of interest! Both EIAs and IAMs have great appeal to progressives who believe that everything is calculable and manageable by informed elites. But in reality, both quickly devolve into nothing more than mental mast—-tion. How do you ban that? A very major error in the Social Cost of Carbon is not including the BENEFIT of avoiding sinking into the next glaciation from a 7 deg C (13 deg F) fall in temperature. Such glaciation, snow and cold would cause catastrophic harm to agriculture with consequent global famines. Can we achieve enough anthropogenic global warming to avoid that catastrophe? How do we provide objective evaluation of those avoided cost benefits? Warmists seem eager to embrace sketchy prognostications, climate or otherwise. It seems really sloppy, especially when they try to use them to fashion policy. The principal absurdity is that the modeling is over a 300 year future timeframe… Apparently it is necessary to go this far into the future because the purported climate change damages come on very slowly, especially sea level rise. Given enough time and the necessary assumptions we can sink many major cities. Whatever the discount rate chosen, the present value of the, “projected global economic damage,” would be so infinitesimally small that going out 100 or more years into the future would essentially be meaningless, mathematically. Will the dollar be the world’s, “reserve currency,” society even use cash to transact goods and services 300 years from now? Will the concept of an efficient allocation of resources even have meaning? Averaging IAMs sounds less like economics and more like building Towers of Babel. I’m a down to earth person. I don’t believe there’s any need to deal with models and projections, etc. Atmospheric CO2 is totally beneficial to the environment and has no health impacts whatsoever. The social cost of carbon is a totally fabricated term they invented so they could create another revenue stream. End of story. Why do we give these inventions any credibility at all? The modeling of the social cost of carbon has too many degrees of freedom to be scientifically useful. From climate sensitivity to CO2, to assumed discount rate, to assumed damages. Each decision made by people with a political agenda. It is scientific nonsense. The political solution is to point this out. The average American is capable of understanding the absurdity of these multi-century predictions. Saul Alinsky’s Rules for Radicals works for more than just progressive causes. So you want to be an “EXPERT” Economist on Climate Change here at CE? How well do you do on these quizzes? That is not at all what I am saying. I am saying that the entire enterprise is absurd from a policy point of view. “Absurd” and “very hard” are fundamentally different. Very hard suggests that more research will be useful. Absurd says the opposite. No research today will improve our ability to say what the world will be like hundreds of years from now. When it comes to policy making these models are simply not admissible. Climate policy is about choosing one future over another. You argue that the distant future is unknowable, and imply that policy decisions should be made based on a position of ignorance. Richard: Could you please point me to an analysis of actually incurred cost of carbon for years 2000-2015? Climate policy is about choosing one future over another. I agree! But I argue the choices have to be well informed and justified on the basis or valid evidence. I am deeply concerned that the damage functions, which are critical for the policy analyses that inform policy decisions, are seriously flawed and misleading. I am not an expert in this subject so I am asking genuine questions, not rhetorical, of you who is one of the world experts on this. I hope you will answer my questions. The question I asked in my first question https://judithcurry.com/2016/12/30/discussion-thread-social-cost-of-carbon/#comment-832472 , and the background I included in it, is the first I hope you will answer because, while the remains unanswered, my scepticism of the IAM outputs will remain. Policy choices should include recognition of the limits to knowability, which are usually quite large. Nor are we ever choosing among alternative futures, because government does not control the future. Policy choices are typically hoped for directions, at best, not determinable end states. I can’t read 1200 papers. And I can’t run models, other than simple ones in Excel where I can change input parameters and view the results – preferably in the charts I am most interested in; e.g., your Figure 3 here http://link.springer.com/article/10.1007/s10584-012-0613-3 and my Figure 1 from DICE-2013R outputs showing net benefit of mitigation policies per 5 years to 2100 (posted @ December 30, 2016 at 10:52 pm up thread). Therefore, I hope you will answer my questions, including references to a just a few papers that provide the answers (suitably explained for non-specialists). If you would prefer I ask you by email, please say so. I’ll condense my main questions below and leave out the background I provided in my previous comments on this thread. 1. Have the researchers of impacts of GW defined upper and lower bounds to the damage function using evidence of how life thrived when the planet was much warmer than now (e.g., GMST 3C higher around 35 Ma ago, 5C higher 40 Ma ago, 7C higher 45 Ma ago, and much hotter for most of the 500 Ma before that)? Can you please post a reference to what you consider the best paper or report on this (suitable for policy advisors and non-specialists)? 2. Have you updated your Figure 3 in the above link (i.e., economic impact per degree warming for nine impact sectors? Reference? d.	Discount rate (up to what has been widely used by aid agencies for investment decisions for infrastructure projects over the past half century or so – e.g. 10% and 12 % by World Bank for energy projects). 5. Can you refer me to a simple model I can use, either in Excel or online, where I can change key input parameters and see the results in charts? I’d like to run FUND and reproduce your Figure 3 (economic impact per degree warming for nine sectors). Is there some way I can do this? •	540 Ma of global paleo-temperature evidence; and arguing warming this century is likely to be net-beneficial, not net-harmful. •	Bias on impacts of GHG emissions – Figure 1 is a chart showing 15 recent estimates of SCC – Lewis and Curry, 2015, has the lowest uncertainty range. You argue that the distant future is unknowable, and imply that policy decisions should be made based on a position of ignorance. Richard, what basis do you have for imagining that predictions are better than ignorance? The models used to estimate the social cost of carbon rest on many assumptions. These assumptions are systematically varied to test the sensitivity of the estimate. There are a number of alternative models, so that besides parametric sensitivity we also test for structural sensitivity. Each alternative model is run by different groups of researchers, so we also test for sensitivity to analyst attitude. The result is 1200+ published estimates. There are three different groups using different methods to reconcile the wide range of estimates. And if you don’t trust all of this, the model codes are in the public domain (except for PAGE), and there are at least three simplified models that we use for teaching — so that you can educate yourself about the social cost of carbon. One of the untested, and questionable, assumptions is that human emissions will significantly change the climate. This is the basic problem with the models. “The models used to estimate the social cost of carbon rest on many assumptions. These assumptions are systematically varied to test the sensitivity of the estimate. The estimates range from almost zero to a lot. How does one choose the value to use? “systematically varied to test the sensitivity” is not a test of accuracy of assumptions. Faulty assumptions will necessarily lead to faulty pronouncements. Certainly, there’s no evidence that global temperature rise has or will change droughts, floods, tropical cyclones or severe storms. Any such is assumptions of climate results in SCC is probably erroneous. In general, precipitation should increase with global warming, given water vapor increases. Such an increase means an increase in available surface water and higher, but more moderate surface temperatures. These are probably not well represented in your assumptions. Even beyond that, it appears that indoor agriculture is much more efficient in terms of money, time, water, and even energy. If agriculture indoors because of profit, what is the relative value ascribed to harm of outdoor ag, assuming the assumptions that have not been demonstrated, were actually true? And if human population is down to 1 billion, or even lower, in 300 years, a very real possibility given current fertility trends, what is the value of existing real estate in such a world? of any present day resources? I do think the gist of the idealized SCC curves is accurate in this regard: current CO2/warming is presently a net benefit ( beyond the benefit of the energy ). Therefore the present cost of carbon is negative. Obviously, there are some bounds for harm. And average temperature of boiling would be fatal. At some point, warming would cause harm, but presently, warming is providing additional benefit. Given that human populations in the developed world are already declining, and that CO2 emissions appear to have peaked – without police state intrusions, all of this points to an embarrassing waste of time. You, of course, need to assess which assumptions are more or less credible, perhaps through a probability density function, or a belief function, or fuzzy reasoning, or whatever your taste. All of this is textbook material. No one predicted what would happen this year. To believe we know what is coming in 300 years is surely no more than guesswork? If you believe it to be otherwise I would be genuinely interested to read what you would base your predictions on? The SCC assumes that the increase in atmospheric CO2 is caused by human emissions. I have seen no clear evidence of that being a fact. There are several analyses that dispute it. How can the whole enterprise of setting a cost for emissions be valid in the least if there is no validated proof of the underlying assumption let alone the wild guesses required to see future events clearly enough quantify their effects? We are mining coal and oil and natural gas. Let’s assume that no one is hoarding them. Let’s further assume that we mostly burn them, not turn them into soot or graphene or diamonds. Then we have a good estimate of a human-produced CO2. I do not expect them to say that the SCC numbers should not be used for cost benefit analysis of Federal actions, which I strongly believe is the case. Interesting times lie ahead policy wise. The project description says they will “…ensure that the SCC estimates continue to reflect the best available science and methods.” So they clearly like the SCC. All these comments make me think of that bizarre statement made some 20yrs ago – “It depends upon what the meaning of the word ‘is’ is.” There is no cause and effect that has EVER been shown. There is no warming model that has ever shown that which has been observed (pro or retro). Yet, based on these terribly flawed/*absurd* warming models, there are those creating terribly flawed/*absurd* SCC models – good grief. And another thing, why do we pander to such silly theories and nomenclature? There are no GHGes per say – we all know the earth has an ATMOSPHERE, mostly consisting of lots of water in some form, lots of nitrogen and oxygen and a teeny tiny amount of CO2 (oh and dirt). If we didn’t have an atmosphere, we would all be warm during the day, and very very very cold at night. Our atmosphere is warm because of the sun’s energy during that day not MORE warm beyond that energy the sun delivered during the day – that’s like saying my pan of lasagna is going to be even more warmer than the oven is when I cover it with an atmosphere of tin foil – ponderous, man ponderous. The DICE IAM produces extreme sea level rise far higher than main-stream estimates. The graph below is from Dr. Pat Michaels’ testimony at the US House of Representatives July 22, 2015. It shows the DICE forecast and the forecast from MAGICC, a GCM emulator, of sea level rise, both using the MESSAGE emissions scenario. MAGICC gives the average of the GCM used by the IPCC, and assumes a 3 C equilibrium climate sensitivity (ECS). I ran MAGICC with a 1 C ECS and added its SRL curve labeled ‘Expected’. The first article in my Climate Science newsletter December 30, 2016 shows the justification for the 1 C ECS. Correcting the Lewis 2015 estimate of ECS (1.45 °C) for the effects of urban warming contamination of the temperature record and for the millennium warming cycle from the Little Ice age gives a ECS of 1.02 °C with a likely range of 0.75 – 1.35 °C. The method depends on long-term heat content and temperature data from 1860. A study by Ray Bates used measurements of short-term radiation changes at the top of the atmosphere during the satellite era. He found that the ECS best estimate is 1.02 °C with a likely range of 0.85 °C to 1.28 °C. [The best estimate is the median of estimates calculated using the midpoint and endpoint of likely ranges of three parameters of the two zone energy balance model] Note that both method give identical best estimates of ECS. Thank you for your comments. Your background shows enormous experience in real world of engineering. d.	Appropriate discount rates, e.g. = 3%, 5%, 7%, 10% (i.e., up to what has been widely used by aid agencies for investment decisions for infrastructure projects over the past half century or so – e.g. 10% and 12 % by World Bank for energy projects). If interested, could you say how I can contact you. The SCC vs ECS values are in table 3, at a 3% discount rate. Table 1 shows ECS at various discount rates. It shows 20.05 at 3%, 1.14 at 5%, -1.75 at 7%, all in US$/tCO2. Note that the FUND default is to use the Ramsey rule for discount rates. This is very helpful for my understanding. Thank you. 1. Can you run FUND? b. Input parameters: damage function, ECS, RCP, discount rate? I recognize the economists use discount rates derived using the Ramsay function. However, these seem to be far below what has been used for making policy and investment choices between various options for public funding. Such low discount rates as are used for justifying mitigation policies are not used by government and aid agencies for making choices between funding Health, Education, infrastructure etc. Therefore, I would also like the sensitivity analyses to use discount rates of 5%, 7% and 10%. The social cost of carbon rises sharply for higher discount rates. If it is correct, could you please explain Table 1. That would be really great. If you get master FUND and produce some sensitivity analyses, and explain effect of changing the damage function input parameters, it could make for a valuable contribution to the debate on validity of SCC and the damage function. For a doubling of CO2 we get a temperature rise of from 1.5 C to 4.5 C with 66 % confidence. I think it’s reasonable to say that for doubling of CO2 we get X to 3X of sea level rise with 66% confidence. Can we say anything more focused? If what I wrote is true, use of the models in this case is not finding the Social Cost of Carbon. Assuming a normal bell curve distribution we’d have 34% in the tails in the first case and 5% in the tails in the second case. We’d also have decreases the range inside the tails by 50%. An audit CPA may say it is from 0.95X to 1.05X with 95% certainty. Call that 10% of the 1X. In the 2nd case * the range is 1X. The audit CPA does 10 times better than the 2nd case, which is 10 times better that what I think is a key element of the SCC. It is true that the CPA is not predicting or projecting anything. With the exception that future liabilities arising from things like lawsuits may be reflected in the financial statements. They are assigning numbers to that in some cases. I don’t mean to wander into the weeds. The CPA is in very broad terms recording and counting what is. They have the tools to say narrow things down by 100 times when compared to the GCMs. And it gets worse because the models are projecting and predicting. All kinds of money is spent to get the narrow range the CPAs have. I don’t think you can get an audit opinion from a CPA, 0.95X to 1.05X with 95% certainty, about a 100 year prediction or projection. They wouldn’t do it. They like being a CPA. Not a 50 year opinion, not a 30 year one. No amount of money can make this happen. If you think my standards are too high, they apply to the Fortune 500 companies audit opinions. They get them annually. That’s a lot of money they are counting. The SCC modeling numbers were first announced in 2010. Three years later they were adjusted upward by a whopping 50% or so. The interagency working group (IWG) in the social cost of carbon dioxide (SSC) claims the the FUND shows at cost of $7.3/tCO2 in 2010, and increased the value to $21.0/tCO2 in their 2013 report. Both numbers are in 2007 US$ for emissions in year 2020. This is an increase of 187%. But the FUND values run by the FUND team shows a decrease in SSC from $8.0/tCO2 in 2011 to $6.6/tCO2 in 2014, both numbers in 1995 US$. Converting to 2007 US$ by factor 1.38 gives $11.04/tCO2 in 2011 and $9.11 in 2014, which is a decrease. Comparing numbers is challenging because the authors don’t always list all the assumptions. Right, but FUND is just one of the three IAMs that are averaged by the IWG. I think the average went up by a little over 50% but even this is not clear, because there are a number of numbers. Ken Gregory certainly knows all that and much more. Read the links he has posted. Just trying to clarify my point, Peter. My interest is solely in the US Government’s use of SCC. Yes, Peter, raising the discount rate is something OMB can do, as well as bounding the time horizon, both of which can significantly lower the SCC numbers. My concern is that this legitimizes a very bad idea. “I’d suggest you follow the agenda you are interested in pursuing and accept that my focus, for now, is on the evidence to derive, calibrate and validate the damage function. My interest is in showing CAGW is not a serious issue and we should move focus onto more important issues for humanity. Asserting that SCC is rubbish is down in the weeds compared with the goal I am interested in. My concern is that this legitimizes a very bad idea. The concept of SCC is not a bad idea. Some way to value emissions is essential if you want to be able to justify policies. You cannot do cost benefit analyses without valuing the damage and the costs of mitigation. So the concept is OK, in fact is is necessary. This issue is whether or not the values being determined are valid. What is needed is valid values for SCC. Peter, I do not think there are any valid values for SCC. The uncertainties are far too great. Peter, saying SCC is rubbish is a crucial step toward banning its use in federal cost benefit analysis, which is my preferred policy outcome. I think it is much too early to encapsulate SCC in an economic technicality like net present value (NPV). When the philosophy that should underpin something like SCC (and why should this type of concept only concern climate?) is far from complete, there is no good reason to define a mechanism for policy design. It is like starting to code before the system spec is ready. Saying SCC is now entrenched is just as futile as saying the science is settled. The fact that (too) many bureaucrats have been busy on this does not mean it is a greater truth. I do not believe it is possible to choose any future now, using something as restricted as NPV. Especially because the proof of anthropogenic global warming is not at all very sound and, if there is such a thing, its mechanisms and parameters are mostly still unclear. For example, in this thread there is mention somewhere that CO2 remains 300 years in the atmosphere. That statement is vague. From the bomb tests in the 60-ies it has become clear that the atmospheric impulse response to CO2 has a time constant of roughly 20 years; that is a lot shorter than 300. By entrenched I mean that SCC has been written into the legal framework for federal cost benefit analysis in ways that will make it difficult to remove. It certainly does not imply that SCC is correct, quite the contrary. Perhaps someone who knows the literature on the US SCC can point to the simple thing that I am looking for, which is just a chart and a number. The chart shows the damages for each year (or decade, or some interval), while the number is the total damages, for one ton of today’s emissions, over the 300 year period of analysis. I assume that in order to get discounted damages we have to have undiscounted damages by time. But then, economics is not my field. You make a powerful case that costs of proposed climate policies exceed benefits at least for several decades, probably longer. Not just decades. The chart shows that total costs for this century exceed benefits for this century for all proposed policies. Note that all scenarios except Copenhagen and my ‘½ Copenhagen participation rate’ assume 100% participation from 2010. However, with what I believe are justifiable input values for ECS, damage function, discount rate, emissions rates, participation rates, the costs would greatly exceed benefits for many centuries, probably forever. This is why I am arguing so strongly to run these analyses with justifiable input values and to run sensitivity analyses on them. Here are some values for net benefits of ‘Copenhgen’ and ‘½ Copenhagen Participation rate’ mitigation polices at 2050, 2100, 2200, 2300. These are from DICE-2013R with all input parameters set as per the defaults in the Excel version (as downloaded from Professor William Nordhaus’s Homepage). The last column is with Copenhagen participation rate halved. Even this is extremely optimistic. If any of the input values ECS, damage function, or discount rate were set to defensible lower values, the net benefit would be much more negative and probably forever. I am strongly of the view, that running these analyses with defensible, justifiable, valid input parameters is the way to show we should not be wasting our money, time and resources, and damaging the global economy and human well-being, on climate policies and GHG mitigation! I think (from what I’ve read) that Mr. Mosher believes everything can be made better with the right amount of ‘adjustments’. Kind’a like bacon. I mean, even Brussel Sprouts become edible with enuff adjustment – sorry – I mean, bacon. Or better, raw data becomes more palatable with enuff adjustment . . . I’ll bet bacon would help even more. Among other things it calls for the presentation of the time stream of costs and benefits. I have yet to see this where SCC is used. 1) William Nordhaus update just released Dec., 2016 on the Dice model to include uncertainties in the long term forecast and new treatment of uncertainties. Reference: Nordhaus, William D., National Bureau of Economic Research Working Paper w22933, Projections and Uncertainties About Climate Change in an Era of Minimal Climate Policies, December, 2016 http://www.nber.org/papers/w22933 (paywalled). (Quote) Climate change remains one of the major international environmental challenges facing nations. Yet nations have to date taken minimal policies to slow climate change. Moreover, there has been no major improvement in emissions trends as of the latest data. The current study uses the updated DICE model to present new projections and the impacts of alternative climate policies. It also presents a new set of estimates of the uncertainties about future climate change and compares the results will those of other integrated assessment models. The study confirms past estimates of likely rapid climate change over the next century if there are not major climate-change policies. It suggests that it will be extremely difficult to achieve the 2°C target of international agreements even if ambitious policies are introduced in the near term. The required carbon price needed to achieve current targets has risen over time as policies have been delayed. A major emphasis of Nordhaus’s update is to include capability of layering in quantification of uncertainty on top of the SCC estimates. – The revised DICE model shows more rapid growth of output and a higher temperature trajectory in the baseline path compared to earlier DICE versions and most other models. This is also reflected in a major upward revision in the social cost of carbon (SCC) and the optimal carbon tax in the current period. – A second result is that the international target for climate change with a limit of 2 °C appears to be infeasible with reasonably accessible technologies – and this is the case even with very stringent and unrealistically ambitious abatement strategies. This is so because of the inertia of the climate system, of rapid projected economic growth in the near term, and of revisions in several elements of the model. A target of 2½ °C is technically feasible but would require extreme virtually universal global policy measures. – A third point is to emphasize that this study focuses on the business-as-usual trajectory, or the one that would occur without effective climate policies. Johnston, Jason Scot, “The Social Cost of Carbon,” article in CATO Regulation, Spring, 2016 https://object.cato.org/sites/cato.org/files/serials/files/regulation/2016/4/regulation-v39n1-4.pdf (freely available). Note: Johnston was mentioned in the Sep, 2010 introductory post of Cliimate Etc. in Sep, 2010 in re his paper “Global Warming Advocacy Science: a Cross Examination” which was said to be very interesting. Climate change remains one of the major international environmental challenges facing nations. If you believe it is a statement of fact then please show the evidence to support it. The evidence has to be in terms of quantified costs and benefits of GHG emissions, not temperature changes or ‘climate changes’. The evidence one would need to present to justify their belief is SCC derived using valid input parameters. Yet nations have to date taken minimal policies to slow climate change. And rightly so. They are being rational. There is no valid justification for wasting money, damaging economies and retarding the rate of development on mitigation policies. The study confirms past estimates of likely rapid climate change over the next century if there are not major climate-change policies. It does not confirm. It agrees with past estimates. It cannot confirm because most of the important inputs used are on the high side of the best estimates – that is they produce high damages. ECS is one obvious example. Run DICE with ECS = 1.65 (Lewis and Curry, 2015) and see what outputs you get. Agree totally. Just how can you confirm past estimates of likely climate change over the next century without the next century having been completed. I also have a major problem with his very large assumption on ECS of 3.1 deg C and would like to see 1.6 deg C as in Curry and Lewis. So what? What’s the justification for the 2°C target? There is no valid justification. It is purely political in response to ideological dogma, not valid evidence. I cannot find any mention of the participation rate he assumes. I expect he has used 100%, which is absurd. I do not understand how he has derived and calibrated the damage function. This is an extremely important parameter in the analysis and should be clearly explained. His latest guess confirms his prior guesses. So what? I think these two papers (Nordhaus and Johnston) complement each other insofar as they represent the extreme positions on SCC … Nordhaus approach in all its excruciating IAM detail is just what Johnston describes as being so dependent on assumptions and approach to be no more than meaningless and whatever you would like the answer to be. Unfortunately this is exactly the type of work that the US EPA has been relying on in pushing their climate agenda. Richard Tol, you have not yet provided any data for an actually incurred cost of carbon in the past. I am forced to assume that there are none. Unfortunately, that implies that a social cost of carbon is a mere speculation. Richart Tol (2013), Figure 3 shows that GHG emissiosn were net beneficial during last century and projects that will continue for most of this century (all of the century if you exclude hypothesised increasing energy consumption assumed caused by human’s GHG emissions). Energy Consumption is the only significant cost out to around $c increase in GMST. Peter, thanks. That’s not what I want. There are labels Storms, Agriculture, Water, Sea level rise, Health, Energy, Ecosystems. For example, the “The global average sectoral economic impact of climate change” on Energy sector 1920-2010 is always around 0.2%. I thought there was very little climate change 1920-1970. I don’t want (benefits minus damages), I want damages alone. I expressed myself badly. I wonder how the “cost” attributed to climate change is measured. Is it the same as an “economic impact”? Table 5.1 and later tables and charts summarise. Once you’ve read that, I can give you more recent updates. Back in the early 1980s, Americans were panicking over the looming takeover of the world economy by Japan. One of the things that struck me at the time was the fear American technocrats expressed over the fact that we have no central planning, while Japan had 250 year plans! As it turns out, not a single one of those included the Internet or the iPhone, both of which have had a more profound effect on daily life than any “climate change.” Japan entered economic doldrums in the 1990s (which wasn’t predicted in their 250 year forecast! ), and haven’t emerged from them yet. This kind of prognostication is crap. The National Academies Greenwash of SCC is to be released on Jan 11 in DC, with a webinar. All come. I look forward to your summary of it. I expect that they will conclude that the present SCC is acceptable but it could be better if a lot of money went into research on it. It is not part of their charge to estimate SCC, that is the Feds job. Their job is to say how it can be refined. I expect at least 100 pages on that, maybe 200. The art is to say how it can be made good without saying it s bad. One basic assumption made by most of these IAM analyses, and reflected by Richard Tol in his discussion with Eshcenback linked in the head post, is that the private benefits of burning fossil fuels are completely captured in the measured GDP figures. These market data are assumed to exhaust the benefits of fossil fuel combustion, so that the only unpriced costs and benefits to be found are the environmental ones. But this analysis significantly underestimates the unmeasured-by-GDP benefits of private consumption of fossil fuels. It assumes that the marginal consumer benefit from goods and services is equal to the average benefit, which means that everyone is assumed to be just indifferent between, for example, eating and not eating once the price paid for food is taken into account. That is crazy–it may be true that we are just indifferent between the LAST, or marginal increment of food that we eat and the price we pay for it, but that is almost certainly way, way off for the earlier increments. Likewise for shelter, clothing, transportation, entertainment, etc. The assumption that marginal value equals average value–what in economics is technically called an assumption of zero consumer surplus–makes calculations easy but is known to be wrong. They simulated imposing a carbon tax that would hold CO2 emissions at 1990 levels (and rebating labor taxes to keep total government revenue constant). IMO their estimate of the taxes needed to accomplish this were very low (and discussant Paul Joskow pointed this out in his included remarks, noting that other people estimated these taxes as being 20 times bigger because they assumed that CO2 emissions would grow a lot faster without the tax), but for what it’s worth they found a fairly small equivalent variation (loss) of about $250 billion (in 1990 dollars) for the U.S. in carrying out this policy. The losses were heaviest for poor, nonwhite households, but still only about .3% of wealth. With more-realistic base-case growth rates for GDP and CO2 burning, these estimates would explode. The discussants also picked apart the optimistic assumption about coal miners seamlessly becoming computer programmers, etc., in the model. The point, however, is that whatever the other details, you can’t really do the cost-benefit welfare analysis unless you look at equivalent or compensating variation–changes in GDP alone do not do the job. I do not understand how a country – e.g. USA – could introduce a price on carbon without reducing its international competitiveness and thus disadvantaging itself. I understand there is a fairly widespread agreement among economists that the impact of GHG emissions is global and any pricing mechanism will have to be global or it wont succeed. But I strongly doubt this will happen – this explains: “Why carbon pricing will not succeed” https://anglejournal.com/article/2015-11-why-carbon-pricing-will-not-succeed/ . I would welcome your comments on this (note: I am not an economist). >I do not understand how a country – e.g. USA – could introduce a price on carbon without reducing its international competitiveness and thus disadvantaging itself. Well, Peter, that’s pretty much what I was saying earlier in this thread: although there may be some theoretical value in debating the merits or demerits of the SCC, there’s no practical point when most of the world has no serious interest in reducing emissions and therefore is not going to make use of it. Robin, the practical point is that SCC is presently US policy, being used in cost benefit analyses to support bad decisions. These bad decisions have very real effects on people’s lives, so this situation is as far from theoretical as one can get. I agree that the IAM debates are purely theoretical, strange even, but that is precisely the practical problem. Hard hitting decisions are being based on speculative hypotheses and assumptions. This is what I call pro-AGW science at its worst. Hopefully the new Administration and Congress will be able to rectify this very bad situation. How is the interesting question? Unfortunately people prefer to debate the theoretical issues, as though that would help, which it will not. although it might perhaps be useful to show that the SCC exercise isn’t valid (although it’s likely to take a long time with believers fighting it to the bitter end), I suggest a more practical way to unwind current US climate policies is to show that, given what’s happening in the wider world, they’re completely pointless. The key is in the parenthesis: it seems to me that your attempt to invalidate the SCC is likely to take a very long time as its supporters will erect near-impregnable barriers to your efforts. Therefore a demonstration that valid or not the SCC is a poor basis for policy when in a global context (the only context that matters re AGW) such policy is pointless is considerably more practical. And it’s an approach that might well appeal to the new Administration. Actually, Robin, a great deal can be done very quickly to end SCC as US policy. Congress and the Administration just have to work together. (It is actually a relatively minor matter as far as administrative law and procedure are concerned.) Here’s hoping they do so. I daresay you’re right that a transition from the SCC would be relatively straightforward. But surely the SCC would have to be discredited first? And, in the face of established and entrenched opinion, I suggest the process of finally discrediting the SCC would take a very long time. I agree that we need to focus on discrediting the current SCC estimates. 2. Damage function and SCC. The damage function is needed for the economic analyses and for estimating SCC. Without a sound estimate of costs and benefits of policy options (including the do nothing option), there can be no valid justification for governments implementing policies to mitigate GHG emissions. More important is the fact that SCC underpins the belief in CAGW. If SCC is zero, GHG emissions have no net economic impact; if SCC is negative GHG emissions are net-beneficial. If SCC is small positive, GHG emissions are not dangerous and not a serious issue. For these cases, we can get over CAGW and move on to addressing more important threats to human well-being. We need a valid estimate of SCC to show whether or not GHG emissions deserve the massive amount of attention they have been getting for the past 30 years. I hope this explains so we can now get onto focusing on what is needed to get valid estimates for SCC. Can we please leave aside for now the arguments about the economic impacts of mitigation policies? On the skeptical side SCC has already been discredited quite thoroughly. If you are not familiar with these plentiful writings you might take a look.The new Congress and Administration are both skeptical. The stage is well set. So what? For 30 years the skeptics have believed what you’ve just stated. That hasn’t stopped Kyoto Agreement, Paris Agreement, EU ETS, US EPA regulations, Obama’s policies, and over 30 years of UN climate chats getting all the countries of the world together for massive pow-wows. It is fanciful to think that just stating that you believe SCC is absurd is going to have any impact whatsoever. “On the skeptical side” – maybe. But there’s another side that’s unlikely to give up easily. I think mine is the better approach. But we’ll see. Note too that when the resulting cost benefit analyses are done, to support Federal actions, the grand uncertainties become irrelevant. The mean is used to generate a specific damage amount, the bigger the better, because supposedly preventing these damages defines the benefits of the action. The focus should be on improving the inputs to the Damage Function. The bottom line is the damage function. Until we have an acceptable central estimate and uncertainties for the damage functions, there can be no valid justification for GHG mitigation policies if the policies will do economic harm (as any policies that increases the cost of energy will do). They are basically calling for abandoning the existing IAMs and SCC estimates and starting from scratch, with “integrated” modules for each modeling step. And of course there are periodic upgrades forever. A massive project that I do not see getting funded, but who knows? If the existing flawed SCC approach were stayed in the process it might buy some rational time. That there might be no damages from human CO2 emissions is not considered. This is straight dangerous/damaging AGW in practice. A ship of fools. They are basically calling for abandoning the existing IAMs and SCC estimates and starting from scratch, with “integrated” modules for each modeling step. Foir Heaven’s sake, this is not the problem. Why on Earth can’t NAS understand that the science has not been done to collect the evidence to demonstrate that GHG emissions will be net beneficial or net damaging? And quantify the benefit or damages per degree of GMST change in an Impact function? What is needed is real science, in the field, collecting data, analysis it, interpreting it, and debating it until the interpretation becomes generally accepted and the Impact Function parameters are widely accepted. It’s the equivalent of quantifying ECS and the uncertainties, but arguably more important for justifying policies to control the climate. If you are still watching this thread, could I suggest a new Week in Review topic for 2017 – Week In Review – Impacts and Impact Functions. Or Week In Review – Impacts, Impact Functions and Policy Implications.